Right kids – it’s the end of the year. This used to mean shops being shut, excessive bloating in a post-holiday culinary environment and continued family tension, but in 2018, it means lists, and lots of them. Farbeit for BTM to be exempt from this, head honcho Andy and bloggerist John Tron Davidson sat down to rattle off our top units of this mad year. It’s a hairy run down to be sure, so affix your person to something robust and check it out! An evergreen favourite of the fuzz world, the Fuzz Face has inspired many a unit, and some righteous re-imaginings to be sure. The Magnetic Effects Black Moon arrived with its influences wide open, unashamed of its lineage or influences. A true-bypass scalper of the most versatile order, this England-built cone-creamer took the original Arbiter circuit and flew it into the stratosphere, with a three-way control of the low end, control over the Bias and an almost alarming amount of grace from its select Germanium transistors. That Input control governs the impedance at the start of the circuit, allowing you to alter the overall gain and EQ to truly deliver exactly what you want. Raunchy but not demented, this was a highly adaptable unit with legions of scope for a huge variety of players. The Foxx Tone Machine is a pedal that could, if it wanted to, kill you. Famously as fuzzy on the outside as it was on the inside, this upper-octave death gun makes a player’s sound truly dangerous, and only a few companies have taken on its wild ways over the years. Zander Circuitry decided to do just that, building this daft-lethal pedal as an homage to the burning acid of the original. Fully acknowledging the crushing, fiercely alive tone of the most flock-covered pedal in guitar history, Zander included a number of features not present on the Tone Machine. While the grandaddy had Volume, Sustain, Mellow/Brite and a switch to change from normal fuzz to that Green-Ringer-style luxurious octave, the Foxxton Woods adds Input pre-gain, low-end Body and midrange Punch controls, as well as a footswitch to turn on the reedy, exhilarating octave side. The first version of the Tone Machine definitely didn’t have a 6-way rotary dial for changing clipping diodes either, granting you access to Germanium, Silicon, Red LED, MOSFET, Transistor and straight-through clipping. Watch the video, and ready your neck pickup for some conduct! Everyone went spare when this thing got announced, and rather than manifesting as some floppy boot, the Plasma didn’t just look unbelievable, but sounded crazy too. It was a pretty bold leap for Gamechanger to go from their incredibly elegant Plus Sustain pedal to one of the raspiest, most ferociously driven pedals in history. Circumnavigating both diodes and transistors, the Plasma fires an electric signal down a Xenon tube to distort your signal. Sounding for all the world like a bursting, bar-fighting droid, the Plasma lets you dial in your clean signal for some outrageous bass activity, or throw the Voltage control and Blend wide open to let your guitar scorch the earth. Sporting controls over the Low and High frequencies, this fuzzstorting ravager wasn’t just a killer sounding unit, but marked a whole new way of building circuits, and that’s extremely exciting. One of the best ways to send your amp running for the hills, no question. The sort of pedal that screams David Rainger, the Bleep appeared and immediately everyone started running around with their arms in the air. Why? Well for starters, it was designed as a ‘greatest hits’ of the Freakenstein, which remains a hilariously engaging unit to play. The Bleep takes things a step further – coming as standard with the latest version of the Igor expression control, it’ll gate, glitch, modulate and death-rattle with the best fuzzes you can imagine. 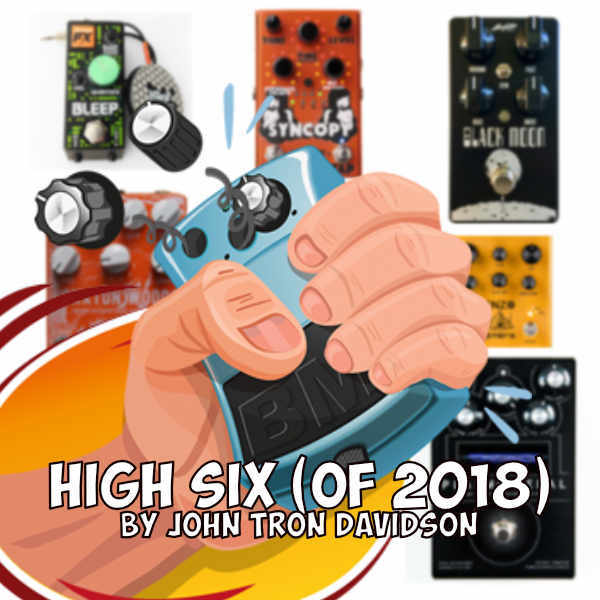 As David told us in this interview, it’s amazing how much you can squeeze into a pedal this size, and in combination with Igor, this dastardly dwarf will do so much you didn’t even know you needed that it’ll keep you entertained for years. Take a spin through the highly intuitive layout and you’ll find Fuzz Gun sputters, velcro splatter, crazy sustain, pulsing vibrato, harmonic overtones and even bits of the RTG, all while maintaining an almost impossible clarity. Of the most entertaining, seemingly bottomless pedals ever, this is a win in any and all languages. Wild! Something else entirely now, from a company seemingly determined to move guitarists out of their comfort zone and into brave new worlds, the Meris Enzo is the best excuse for not leaving the house you’ll ever have. Not content with being a synth pedal that behaves like an actual synth when it comes to filter sweeping, the Enzo contains everything from tremolo to ring modulation, double-stacked delays and envelope filters, but laid out in a way that guitarists can use, rather than staring blankly and turning knobs forever. If you want to get all Tangerine Dream up in here, that’s a goer. Vangelis will deliver your mail, and Isao Tomita sends you a big thumbs up. Pitch-shifting operates between -2 octaves and +2, and using the Alt controls you’ve got 6 different filter types to choose from. You even get access to that one thing guitarists are always banging on about – infinite sustain – and if you plug in an expression pedal, you can move effortlessly (and dramatically) between two sounds. A breathtaking experience to say the least, watch the video and experience the other side of tone! It’s a delay! Not just any delay though, the Stone Deaf Audio Syncopy. Known for their bone-breaking fuzzes amongst other things, this pedal takes a sideways approach to the echo plane, allowing you one whole second of delay. ‘Okay’, you’re thinking, ‘but what can I do with one second?’. As it happens, quite a bit. Through extremely clever stacking of the controls, the Syncopy lets you create everything from warbling vibrato to rotary sounds, syrupy chorus and granular ambience. Holding the Tap button down lets you max out the feedback for sudden swells, and the expression-in can get you into some way-out territory, even allowing you to spin the Rate and Depth to their maximum setting for some full-tilt cinematographic exertions. Did we mention that it lets you store presets too? It does indeed, and as we pressed on, it was hard not to be impressed at every turn with the possibilities of this thing. One second? Plenty. So there you have it – our hefty top 6. Who knows what new ground will get broken next year – we’re just as excited about it as you are, and we’ll keep right on top of it, don’t you worry. Stomp into 2019!